As anyone who has worked with me will know I’m a bit of an Apple fan. My laptop is an Apple MacBook Air. My phone is an iPhone 5 (I have an iPhone 4S and an iPhone 3G sitting in a draw somewhere too). My tablet of choice is the iPad Mini. My external monitor for working at home is an Apple display. My TV serves as a dumb screen for my Apple Mac Mini, with a TV tuner plugged into the Mini so we even watch and record our TV through a Mac. You get the idea: I like Apple products. Being something of a fanboi, I also like to keep up to date with the latest and greatest rumours about what the super secretive Apple may be adding next to their product portfolio. As anyone else who is interested in such things will know the Apple rumour mill is so big it’s almost an industry in itself. 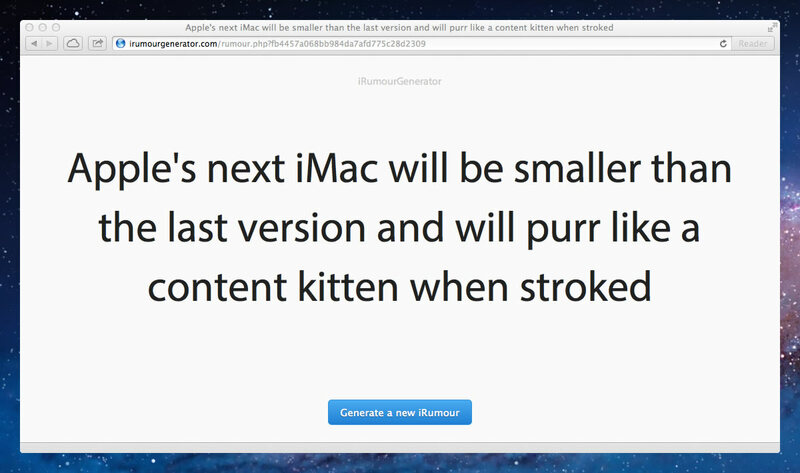 Sites like Cult of Mac, AppleInsider, MacRumours started the trend. Sites like TechCrunch, the BBC, the Guardian, etc stoked the flames. These days any site that is even remotely related to tech news will jump on any story they can concerning Apple in the hope it will open the floodgates to the lifeblood of the web: page views. So powerful is the desire to report the latest Apple product updates and upcoming releases first, some sites will publish stories that are so far fetched or obviously bogus that even a child could tell you they aren’t true. Every man and his dog has jumped on the Apple prediction bandwagon. And now, so have I. Over the past few weeks whenever I’ve had a spare moment or two, I’ve used that time to design and build a labour saving device for all tech journalists / futurists / Apple rumour spreaders. Get an instant, automatic, Apple rumour generated for you right before your very eyes at the push of a button. Go try it out.